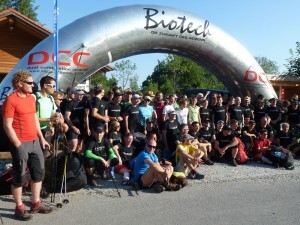 I’m stood under the inflatable Biotech start gate with other CrossAlp’ers, wondering with trepidation what this 33 hour event is going to be like in a German heatwave ! With the group photo taken, its 5 minutes to go, I decide that a long sleeved base layer is unnecessary and lose another few grammes. At 08:00, the gun signals the off and pilots start heading in a variety of directions. After long discussions into the previous night with Till Gottbrath (NPT Captain, local expert, but sadly confined to his bed due to back problems), I had a clear plan to get to the Zinnenberg (1565m) and then move on to Spitzstein if the day was unflyable. I got to the launch site in good time, but it looked stable with little air movement. I was unsure if I should stay and wait or keep moving; I called Till, who told me to stay patient and wait for it to work in the huge amphitheater of a bowl below Zinnenberg. Others started to appear and gather at the small grassy shelf that was one of the few places to take off here. After an hour, it was clear that it was going to be flyable, so a handful of pilots launched and gained reasonable height above the ridge; this convinced me that the time was right to go. Having crossed to the Breitenstein with reasonable height, I thought it would be possible to cross to the Unterberghorn (1773m) above Kossen and then continue onto the SE. As I crossed the valley above Kossen, I realised it was going to be tight, then I looked back to see a gaggle climbing up to a cloud much higher than I had managed to climb; I should have waited there another 20 minutes. I was now running out of height and made a quick decision to land half way up the Unterberghorn on a flatish part of the skislope. As I gathered my kit for the 30 minute walk up to a suitable launch place, I turned around to see another 6 or 7 pilots lining up to do just the same. After a short but very hot climb up to the official launch area at Kossen, I stopped at the restaurant and downed 2 huge glasses of cold orange. By this time, the pilots who had crossed much higher were now climbing out above the Unterberghorn, so I knew it was time to go again. Fully recharged, I took off again and climbed out with a green Icaro wing, with the lift getting stronger on every turn. Once I reached 3200m, I headed for the Loferer Steinberge rather than take the more easterly track towards the town of Lofer. Having gained lots more height I pushed onto the south side of the Leoganger Steinberge, now enjoying the stunning view of the Pinzgau valley and beyond. A really lifty line across to the Wumkopf (2451m) and got me into a good position for a glide towards Hochkonig, but the further I flew East the more height I lost. At this point I could see a couple of other wings lower down on the face above Hinterthal, so I decided to turn around 45km away from my take off point at Kossen. With hindsight, I should have pushed on further, but I couldn’t help remembering my walking route calculated distance from Hochkonig area being 100 km ! On the way back I climbed to 3900m, but then got low crossing back to the Leoganger and got to take a pretty close look at the top of this mountain; thinking that this was not a good place to top land. Then as I got closer to Loferer, I found a good climb which took me to over 3500m again (at 1730! ); more than enough to fly back to Kossen. Having passed the place where I had launched earlier in the day, I headed towards the Walchsee lake, eventually deciding to land there as a storm was coming towards me from the Inn valley. Everything was starting to lift, always a bad sign so late in the day. After a relaxed breakfast at Till’s, I set off (with my Wife, Shirl) to cover the remaining distance to the finish in Grainbach. We made it back with lots of time to spare, so enjoyed watching other competitors who had either flown all the way back or those rushing in before the 17:00 deadline. I said it last year, and it is the same again – this is a great fun competition and many thanks to the CrossAlps team who organised it (and Till for sharing his ‘local knowledge’). be welcome again next year. Hopfeully I can join you then again.